Welcome to the Game of Dukes, a series that draws from Victorian London’s finest drawing rooms and its darkest rookeries. Some dukes are peers of the realm, others lords of London’s underworld, but all are relentless in their pursuit of justice, power, and passion. These commanding men will meet their match—in the strong, feisty women who capture their hearts. Thrown together by crisis, Harry and Tessa will test the bounds of desire, loyalty, and trust. On the run from their foes and from their own hearts, they must find salvation in each other—before time runs out. Heat level: This is a hot historical romance with steamy love scenes. 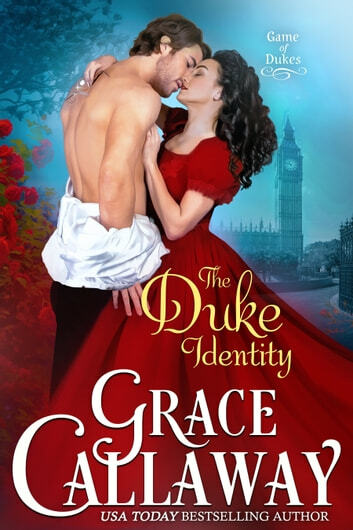 USA Today & International Bestselling Author Grace Callaway writes steamy and adventurous historical romances. Her debut book, Her Husband's Harlot, was a Romance Writers of America Golden Heart® Finalist and a #1 Regency Bestseller, and her subsequent novels have topped national and international bestselling lists. She’s the winner of the Passionate Plume Award for Historical Novel, and her books have been honored as finalists for the National Reader's Choice Awards, the Maggie Award of Excellence, and the Daphne du Maurier Award for Excellence in Mystery/ Suspense. Growing up on the Canadian prairies, Grace could often be found with her nose in a book—and not much has changed since. She set aside her favorite romance novels long enough to get her doctorate from the University of Michigan. A clinical psychologist, she lives with her family in Northern California, where their adventures include remodeling a ramshackle house, exploring the great outdoors, and sampling local artisanal goodies. An exciting adventure featuring a scholarly policeman Harry and Tessa, granddaughter of the Black, the king of the underworld. Harry is on assignment to take down Black and has a chance encounter with Tessa. Hired to protect her, he hopes to get close to her grandfather but sparks begin to fly between the two! Harry had really closed himself off after a terrible incident when he was a scientist and was forced to put his work aside. Tessa fits right in with the underworld and is able to blend in with the scourge of society. But she is really a very independent, full of life woman who wants to be let out from how tightly her family has held her. The interaction between Harry and Tessa is so intriguing and they have a long road to begin to trust each other. I loved seeing the characters develop with each other and the trust and love between them grow. This one kept me turning the pages and I really was disappointed when it ended. I cannot wait to see more of this series!! Another fascinating novel by Grace Callaway! She draws the reader in not only with the strong characters, but also with her well woven histories and interesting plots! Her books are so well written, setting the scenes so that one can actually feel being transported back in time to Regency England. Not only that, but she’s the first novelist I haven’t been compelled to offer my editing skills! I’m definitely going to miss the Kent clan - what with their love and devotion of one another and unique investigative techniques. Each novel urges the reader to learn more about them, thus compelling her readers to go on to the next story to unfold! If I may make a suggestion, Grace. Could you not compose a series of ‘Kent Family Mysteries? With such a large family, and all the friends and acquaintances they’ve made, would not such a leap be made possible? Please think upon it. A very interesting and well-written read. Thank You to the author for a lengthy developed story for Harry and Tessa. I loved this couple both as individuals and as a couple. Each lead unique lives with unusual daily pursuits, and as clever kind and loving persons they also deserved to find each other and share a a wonderful future. There is danger to face and irresistible attraction to deal with, and equally enjoyable are their family and close friends we meet along the way. I am voluntarily providing an honest review of an advance reader’s copy.